The traffic on our websites during the games was significant enough to have a day-to-day look at our tactics and adjust where necesary. What’s media talking about? What are people talking about in social media? Is there a cool story we can leverage through content? Is there something unexpected? Should we send a Field Reporter? Do we make adjustments to our PPC campaigns? Daily huddles and conference calls with our online partners allow us to quickly change plans. 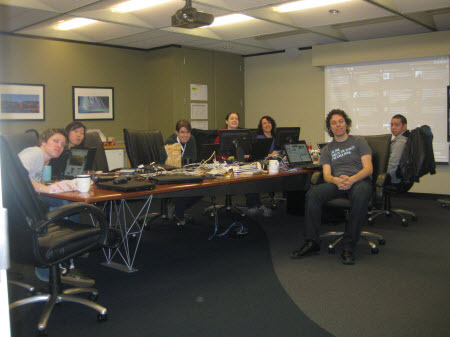 We turned one of our boardrooms into a command centre for the occassion: the Battlestar. Watching the games on a big screen and real time Tweets. 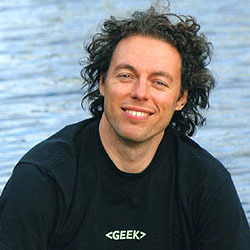 Because we’re geeks after all. This is also my opportunity to thank everybody on the online team, other Tourism BC teams and our partners who were instrumental in making the best use of this Olympic opportunity! When somebody is interested and inspired in British Columbia as a result of the games, we’d like to the person to start the planning process. And in the planning process, content is King, and details matter. 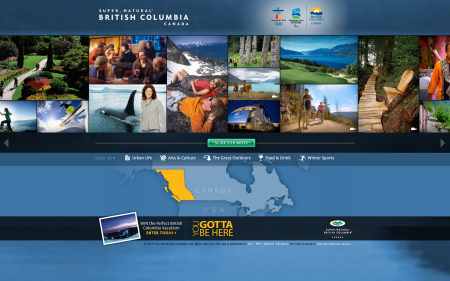 Over the last few years, our product management and content teams have done an incredible job of turning HelloBC.com into an in-depth travel planning resource. 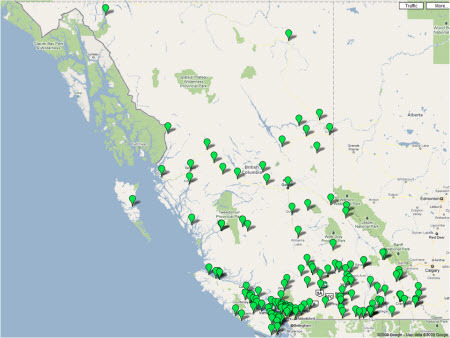 HelloBC contains information for over 100 different activity categories in 6 regions. But that wasn’t enough. Our website users told us they need more information at the community level in order to make the decision to visit. Over the last 18 months, our content team, lead by our content Queen Mikala (also part-time indie rock groupie guru) has completed a monumental task by creating in-depth information for 139 communities across the province before the start of the games. In strong collaboration with of our regional and community partners, our writers visited 139 communities across the province, meeting with local stakeholders, touring the community and creating in depth information for HelloBC.com. The result is unprecedented. Thousands of pages of content; whether you’re interested in Cat-Skiing near Kaslo, Kermode Bear-Watching in Klemtu, mining tours in Trail, Aboriginal & Cultural experiences in Kamloops or visiting farms & Orchards near Harrison Hot Springs, the information is all there on HelloBC. Anybody interested in BC as a result of the games will have all the information to create their BC vacation. 02.22.10 | Permalink | Comment? I’ve covered what we’re doing with Olympic related websites and how we drive interested people to our websites. To make sure the traffic we receive during the games is maximized we’ve worked for a long time on making the website the best it can be. The next few days are dedicated to it these activities. 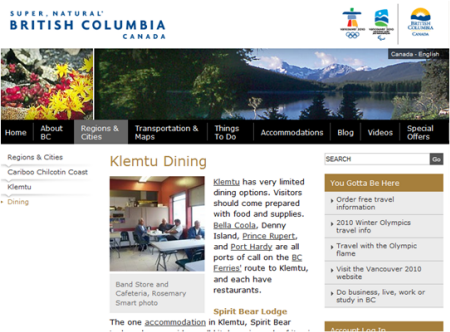 HelloBC typically receives a lot of visitors who already know something about BC. 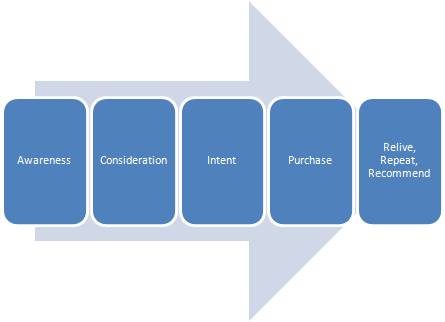 In the purchase cycle, they are beyond the awareness stage and are already considering or intending to take a trip. What we’ve learned over the years is that these people are in planning mode and need information first, inspiration second. That’s why content is a huge priority for us (more about content later this week). 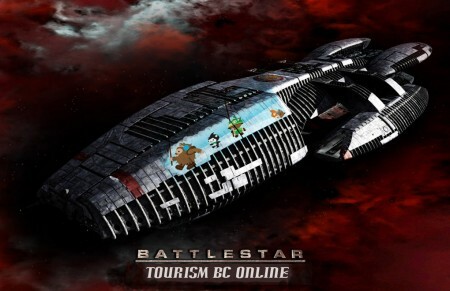 During the games, a lot of people will learn about BC for the first time. We call these people the newly aware. People earlier in the cycle need to learn about the destination and be inspired to visit. Everything related to the Olympics will provide a lot of inspiration and when they visit HelloBC, we’d like to continue to inspire and educate the consumer about everything BC has to offer in the process. I left our online activities for a day to take in an Olympic event myself. 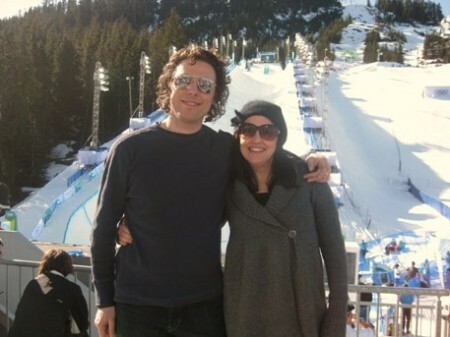 Sheri and I went up to Cypress Mountain to watch the snowboard halfpipe for women today. It was an incredible day. The weather was fantastic, our seats awesome and the athletes unbelievable. Torah Bright from Australia was a great winner. The event was perfectly organized. Staff and volunteers were incredibly friendly and helpful. The transportation by bus to the mountain was flawless. Hundreds of buses were waiting to drive people back to the transportation points. Cudos to VANOC for this one. I described how we maximize exposure on Olympic related website. 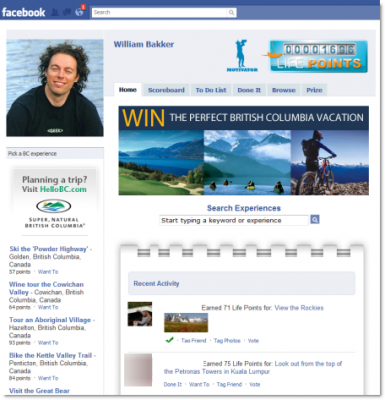 The next step is to drive people to our consumer website HelloBC.com where they can start planning their trip. 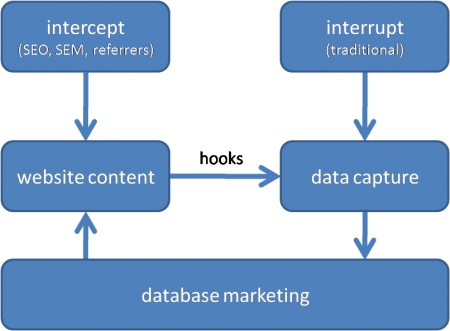 The following chart is a conceptual diagram of our approach for driving traffic from these websites through referral links. The Olympics are about stories. 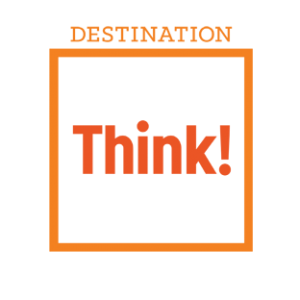 Stories related to athletes, the events and yes the host destination. The circles on the diagram represent these stories. Most are related to the sporting events and athletes (blue). But some are related to the host destination (yellow). 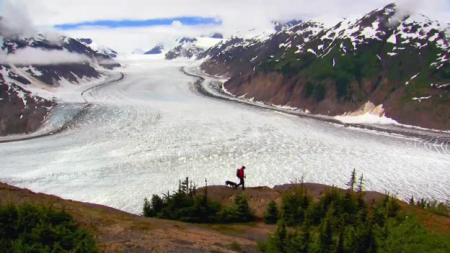 These stories can send somebody down the path that will lead to visiting British Columbia. We try to carry the destination stories through. Many broadcasters will run host destination vignettes on their TV broadcast. These stories are usually also posted on their website and media will often refer to their website for more info. And since the web doesn’t have a finite amount of space, there are more stories posted on websites. 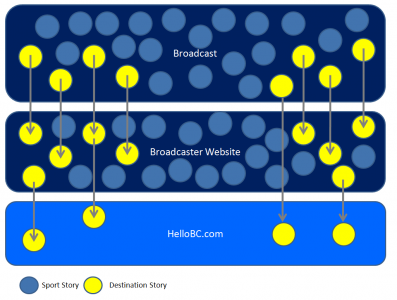 By offering ideas and support, most broadcasters have agreed to post links to HelloBC or one of our tourism partner websites to allow visitors to have access to even further depth, allowing us to continue the consumer buying process and get her one step closer to visiting BC. The strategy is working so far. Visitors from referring sites have increased more than tenfold compared to peak traffic in the summer. 02.16.10 | Permalink | Comment? Billions of people watch the games on TV. And the games are the biggest commerical a destination can wish for. Because besides the stories about sports and athletes, the destination plays a lead part. TV viewing has changed. People watch TV together even if they’re not in the same location using laptops and phones. 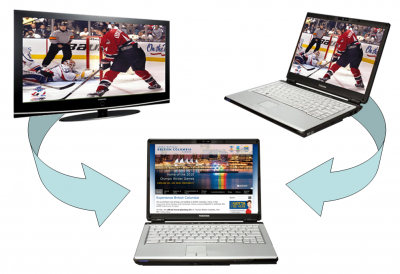 Research conducted almost 3 years ago during the NBC finals shows that people multitask while watching sports. It’s one thing to read research about people texting, IM-ing, tweeting and posting on Facebook. But when I came home one night and I saw my wife Sheri watching Americ’s next top model, while texting her friend and chatting with her sister on Facebook it became real to me. People also watch TV online. During the Beijing games, 52 million people in the US watched a video stream on NBCOlympics.com. In Europe and China even more people streamed the games online. The point us that it’s easy for somebody to research something that catches their attention on TV. When somebody is intrigued by the destination story, a laptop or other mobile device is close by. That means a big opportunity for us to follow through on the initial awareness created through the games and encourage consumers to start the trip planning process. Our strategy to drive people to our consumer websites during the games involves using refering links from high traffic Olympic related websites, Search Engine Otimization and Marketing, advertising and social media. I’ll highlight each one in the next few days.